How do I stop Google indexing a particular page on my site? Two events this week could herald in the clash of the titans as the two global IT giants, Google & Microsoft slug it out for global internet dominance. Or so one might believe. Meantime on 2009-07-07 Google announced its new Linux-based Chrome OS operating system that some believe could unseat MS Windows from the "top slot" - especially on lightweight machines such as netbooks. Frankly I don't feel M$ Azure is worth commenting on - especially when one considers that Microsoft's other web ventures have been far from the success we were told they would be. In any event, I don't suppose the geeks at the Googleplex will be tearing up their beanbags and crying into their hi-caffeine cappucinos over it! However, I suspect Chrome OS might give lardy-boy Balmer and his buddies over at Redmond something to think about. One can already buy motherboads with Linux on-board for quick booting. It is quite possible that Chrome could be flashed into the BIOS instead. This would mean that users could run their machines without any disk-based OS at all. It means that users could buy their computers with the onboard OS only and choose thier disk-based OS at a later date, assuming they actually wanted one in the first place! Currently, here in the UK, it is almost impossible to buy a PC without Windows on it. This means that Linux users buying new machines are forced to buy MS Windows licences that they will never use. And very few suppliers actually honour the MS EULA that quite clearly states, "By using the software, you accept these terms. If you do not accept them, do not use the software. Instead, return it to the retailer for a refund or credit." Folks familiar with Garfnet will know that we dumped Windows several years ago, partly because of issues with Vista and partly because we became fed up with crashes, viruses, spyware, BSOD's and the stupid re-authentication palaver whenever we changed a bit of hardware etc. Then there was the introduction of what Microsoft rather cynically dubbed "Genuine Advantage". That hideously Orwellian piece of doublespeak effectively allows a foreign corporation, in a foreign jurisdiction to have access to a lot of information about our computing to which I felt it had no legal or moral right. However, based upon currently available information, it is unlikely that we will run Chrome OS either - other than as an experiment or because it came preloaded on a motherboard. Despite its open source credentials, I currently have doubts with regard to issues such as privacy. One could argue that Google already knows too much about us as it is! Interestingly, this is a case argued quite convincingly by John Paczkowski in his recent article entitled "Chrome OS, huh? Will it be based on a Google Analytics Kernel?" Other observers such as Andrew Orlowski, believe it is all hype anyway and that Google Chrome OS is no threat whatsoever to Microsoft. Writing in UK-based e-zine The register, in an article entitled "Google's vanity OS is Microsoft's dream, snug as two bugs in an antitrust rug" he argues that this is an enturely phoney war. 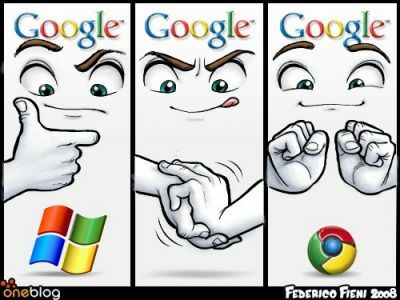 Neither Microsoft nor Google are seriouly encroaching upon each other's territory. Morevover this actualy makes them both look "competitive", when, in fact, they are not. He may have a point. Seems Chrome OS is aimed at the relatively small netbook market. ...and there are plenty more examples if you Google it! So I don't expect it Chrome OS to unseat Microsoft on its own. After all, we know very little about Chrome OS, let alone how much market penetration it will achieve. However, it could add another wound in a death of a thousand cuts for the mighty MS.
Point is that Chrome OS, along with a raft of other technologies, including smartphones and cheap PC's with on-board, instant-boot *nix-based OSes, could slowly but surely render bloated, disk-loaded OS's somewhat irrelevant for the majority computer users. Thus MS Windows could become an optional extra rather than supplied as standard. If this comes to pass, then non-Microsoft users such as yours truly will finally be able to buy the hardware we need without being forced to pay a Microsoft Tax. Scott Gilbertson | "Five questions about Google Chrome OS"